Woodstock is one of the oldest suburbs in Cape Town and it is also one of the hippest. An incredible mix of diversity and cultures combine to make the neighbourhood a vibrant, bustling blend of food, fashion, arts, and design. Woodstock is a place to be seen and heard, favoured by locals for good reason. The best part about the Kitchen is the woman behind it, Karen Dudley, whose natural warmth and hospitality is very much a part of the ambience you will find here. They also do catering for all sorts of events. The menu changes frequently, according to what’s fresh. Situated at the foot of Devil’s Peak in the Devil’s Peak Brewing Company, The Taproom pub and restaurant is one of the best spots in Cape Town to enjoy a hearty meal with an ice cold craft beer. Beers on tap include Devil’s Peak’s Founders series (King’s Blockhouse IPA, First Light, Woodhead Amber Ale, Silvertree Saison) with four rotating taps, including beers from the Explorer series as well as some of the breweries experimental beers. The food is designed to go hand-in-hand with the beer and includes dishes like their unique Cheese Burger, legendary Pulled Pork Sandwich and many more dishes to choose from. And never fear if beer is not your thing—there is a wine list available, and various craft liquors like Jorgenson Vodka and Inveroche Gin are also served. One of the coolest places to be is the Pot Luck Club. Located in the Old Biscuit Mill, the Potluck Club is all about sharing their delicious food and encourages guests to order for the table, tapas-style, and for everyone to dig in to the meal. This famous restaurant is a must-visit for locals and tourists. Established by top chef Luke Dale-Roberts, the Test Kitchen has quickly raked in the awards and become one of Cape Town’s top fine-dining restaurants. Everything on the menu is carefully chosen—from the fine wines to the ingredients that go into every dish. This isn’t a place you can just show up to and grab a seat. It’s booked out months in advance so call now for a future reservation. A cosy little spot in Woodstock that prides itself on its fresh ingredients—homemade tomato sauce, fresh fish, and daily dishes. You come here for the food and trust us, you won’t be disappointed. The Woodstock Lounge has a fresh, light, and airy look and it’s sophisticated but casual. The restaurant provides a warm and welcoming atmosphere and is a great space for drinks after work, family meals, and catching the rugby or football. In the heart of Woodstock, you will find this awesome Caribbean-themed restaurant, complete with cocktails, fantastic food and a laid back vibe fit for the islands. It’s a top spot for a drink or a meal after work or on the weekend. One of the hippest markets in Cape Town is the weekly Neighbourgoods Market in Woodstock. Housed in the Old Biscuit Mill, a converted mill house, it offers a number of quirky shops selling crafts, clothingm and jewellery. If you go—go hungry! The highlight here is the incredible food stalls tucked in the back of the market. Find everything from breakfast fare to dumplings and gyros with craft beers to wash it all down. If busy markets aren’t quite your thing, try the quieter Palms Market, which happens every Saturday. This market offers a variety of things to see, do, and eat for the whole family. The idea is that it’s a rural, proudly South African atmosphere in urban part of Cape Town. There is a great variety of food (think homemade pies, marmalades, gourmet mushrooms, gourmet sandwiches and much more) and often some live music. The kids will love the unpretentious, relaxed set-up of everything while the older ones will enjoy the variety on offer. Started in 2008, the Woodstock Peace Garden was originally a barren area, but has since become a beautiful garden space. There is an aquaponics system, a labyrinth, and a play area for the autistic children from Alpha school where they can learn about nature and recycling. The peace garden can be found at the top of Mountain Road, just as the road curves beneath the highway. Stretching, breathing, meditating… doing yoga is a great way to start the week. Air Yoga and Meditation is situated in the Woodstock Exchange and offers Ashtanga, Jivamuti, and Acro yoga classes. If you’re keen on going really, really local, there’s no better place to do it than at the Locomotive Hotel. This former hotel (and other things which shall not be named in this article! ), situated at the point Woodstock becomes Salt River, is home to a very down-to-earth fave hangout for locals. The alcohol is affordable, the pool tables worn but working, and the atmosphere – festive! The regulars are welcoming and hugely entertaining in equal measures. At The Old Biscuit Mill, you can power up your inner Sherlock and get some friends together for a HintHunt. This fantastic murder mystery game has you racing against the clock to solve a crime in order to escape from the room you’re locked up in. Take an inspirational trip to Taunina in Fairweather House, Sir Lowry Road. Unassumingly tucked away in a quiet corner of the building, you’ll find a myriad brightly coloured bespoke teddy bears which are transforming the lives of the incredible women who have made them. 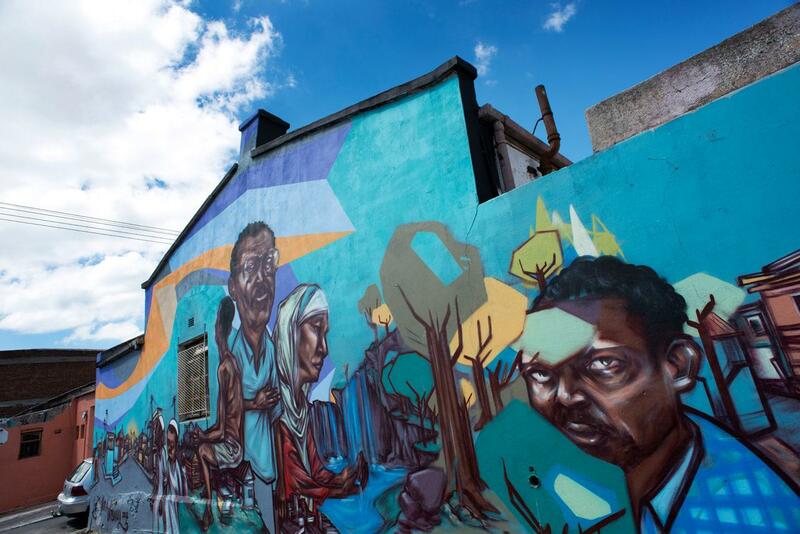 Explore Woodstock’s colourful side streets on a guided Street Art Walking Tour. This experience is hosted by an enthusiastic and knowledgeable mural artist, Juma Mkwela, and gives you a glimpse into a number of this eclectic suburbs’ different facades. This second hand store in Salisbury Road, Woodstock, is an absolute treasure trove. The have fantastic retro items, including quirky accessories, coats, and boots. They stock both men’s and women’s clothes, so make a day of it. Garden Court Nelson Mandela Boulevard is a delightfully convenient, superb destination for business and leisure travellers alike. Offering easy access to major highways, this Tsogo Sun Hotel is a mere 15 minutes from Cape Town International Airport while also being close to the Cape Town International Convention Centre and bustling CBD. A host of conferencing options are offered for business travellers, while holidaymakers are also catered to with ease. DoubleTree by Hilton Hotel Cape Town overlooks the busy Cape Town harbour, with an impressive backdrop of the green slopes of Devil’s Peak. It offers easy access to the vibrant downtown area and the central business district. Cape Town International Airport is just 15 minutes away. Best of all, you’re welcomed on arrival with their signature chocolate chip cookie. Located in the heart of Woodstock, Wish U Were Here is the perfect home away from home. The lodge has individually decorated rooms to choose from, an awesome communal lounge, and an outdoor terrace, complete with BBQ area and bar. Nobody knows Cape Town better than a local. When you’re in town be sure to visit the local VIC in Burg Street where staff can help you really uncover the magic on offer in the Cape Town City Bowl and beyond. Take a walking tour with one of two guides who depart daily from the Information Centre, Monday to Saturday. Call 0861 322 223 for more details.